Rebecca Black Photos, News, and Videos | Just Jared Jr.
Dinah Jane gives us queen vibes and Vanessa Morgan casts a spell over us as they arrive at the 2018 Just Jared Halloween Party presented by Carl’s Jr. at Goya Studios on Saturday (October 27) in Hollywood. The 21-year-old singer and 26-year-old Riverdale actress hit up the party in striking looks, along with Daniella Perkins, Madison Pettis, Laura Marano, Niki Koss, Loren Gray, and Luna Blaise. Author Chris Colfer dressed us as a red devil, and Brenna D’Amico was a vampire at the bash, alongside Anne Winters, BFFs Kelli Berglund and Paris Berelc, siblings Maia and Alex Shibutani, singer Rebecca Black, Landry Bender, and angel Laurie Hernandez. 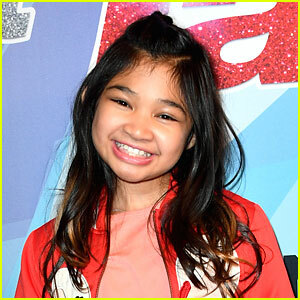 The 10-year-old America’s Got Talent runner up is making her feature film debut in the upcoming movie American Reject. Rebecca Black didn’t get a seat on The Four when she appeared on the show last week, but she sure left a mark. The 20-year-old singer already had a fan in judge Meghan Trainor on the Fox reality series and in a new interview, opened up about her experience. Just after her appearance, Rebecca released the video for her new single, “Satellite”.